I did yesterday. Check it out. I have had a Glock previously; it's nice to have one again. I agree. My EDC P228 W German fits nicely with my bedstand, TLR-wearing, home-defense Gen4 17. What a pair! I always hated the feel and swore never would get a Glock, that was about 6 months ago.I never fired more than a handful of shots through it so my assesment was made just handling it in the local gun store. I got a G17 as trade for some work and gave it some range time and found that while the grip feels uncomfortable compared to my 239 or 1911 I actually shot it better than any other gun I have had. I now have a 19, 21, and 26 to go with it. I had a 30 with night sites about 10 years ago for about 6 months until the friend I bought it from wanted it back. I quite liked it. 4.5 years ago I needed to get a gun for a job. I was 95% sure I wanted a .45 and 90% a Glock. I touched my first Sig and it was all over. A 229 was my first Sig. Sig fits me well and so far is my favorite and I don't see that changing. Until today my only other and current Glock has been a 23 GBB airsoft. I figured some day I might go for a 17, 19 or another 36. I did not like the 23 gen4. I shot a 32 gen3 almost as well as my 229 in the same caliber. I am picking up a 29 today. $500 LE/EMS package. I still don't think it fits me quite so well as a Sig but, obviously, I think there is something there worth getting with some promise. 10 mm is the only fairly common semi caliber I didn't have. Now I need dies, loads, holsters etc. I wonder if the wife will like it. G26 gen4 (layaway) did not have time will get it sometime this week. Sad I can't think of another model I need. I just sold my G32 and do not want another caliber or I would have a SF29. Glock - truly the best deal that comes out of the box. and a lot more Gen 4s after that!! If anyone has a g19 and/or g32 gen 4 in the Dallas area I'd love to shoot it for eval. 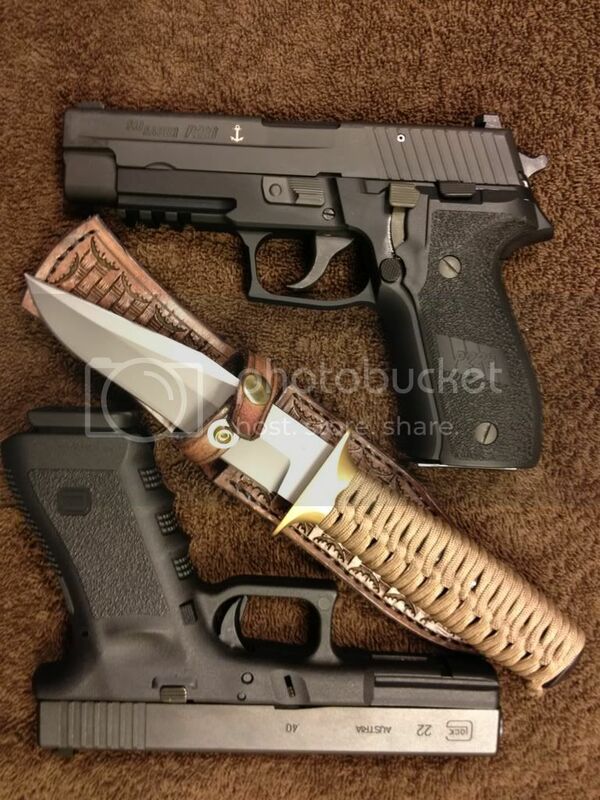 I will let you shoot my 229 &/or 239 in 40 or .357sig in exchange. I want to run about 50 rounds through the latest 19 and 32. Finally found a 17L, will pick it up this week. Think he has a few left. You have discovered what many other "shooters" on Internet forums always seem to overlook. You have to actually go to a range and shoot the dang thing to form any useful opinions. Congrats. Welcome to the forum. One of my favorites is how certain things "feel". The "feel" of a gun doesn't matter. How it performs on the range does. Ditto for grips and triggers. Same thing for sight preferences. Paper doesn't lie. I'm an instructor and an experienced shooter. Bought my first Glock (G34) last year, primarily in preparation for advancing arhtritis in my fingers. At some point I probably will have problems with my DA/SA Sigs and maybe with thumb safeties on my 1911's. Thought I'd prepare in advance. Never shot a Glock before. First time out at my LGC, our defensive handgun group was running fast drills from the holster. After a number of mixed drills at seven and 10 yards, nearly all my shots were in a two inch group. The damn thing shot slightly better than the guns I have shot for decades. If you asked me beforehand what I thought about the "feel" of the Glock, I would have said "Not crazy about it." If you asked me now, I would say "Who the hell cares?" Beauty is as beauty does. The Glock trigger is one of the easiest and cheapest triggers to adjust. A combination of polishing, connectors, and trigger springs can give one a multitude of trigger weights. I'd take my Glock trigger over ANY other polymer pistol. I like a 3.5# connector with a stock trigger spring. He clearly needs those two and a Glock 20 and 21... and then a second of everything just to be sure he covered all the bases. I honestly do not think you can have enough Glocks. Oh, yes you can...especially if you have to answer to your spouse. I see one (or several) joining my collection in the very near future. It was a bad idea for my wallet to have tried my friends G23 right after my SP2022 as I shot the Glock soooo much better. Thinking G32 and G33 pair. Kind of upsetting that I can pick up a gun that I have never fired before and shoot it better than a gun that I have been practicing with and carrying for almost three years. ......Kind of upsetting that I can pick up a gun that I have never fired before and shoot it better than a gun that I have been practicing with and carrying for almost three years. A common complaint among first time Glock shooters. Naw I really only need the 2 G27's and I may have the G35 is it the one in 40? Really would not mind selling down to just the 27 & 23's. Would never own a Glock. Why would I ever need one? Maybe they are good. So what? They aren't any better than Sigs. I like my sigs, thank you very much.